As we understand it, you humans have now changed your Julian calendars to mark the tenth month in your year. Though it is apparent you eagerly anticipate the end of your annual cycle by buying gifts, flocking to mercantile centers, and hanging confusing decorations to acknowledge this passage (e.g. we have yet to understand the point of adorning plastic shrubbery with glass baubles), we do appreciate the fact that you still acknowledge October 31st as All Hallows’ Eve and attempt to celebrate the holiday to varying degrees. We would now like to take this opportunity to speak about our contemporary involvement in your society and address our concerns for this date. After which, we will be making a small request we hope you will consider fulfilling. First, please understand that we do acknowledge that some of you are more superstitious than others–and for this we are grateful. Our initial intent when we emerged from our millennia-old hiding places in the natural world was not to eradicate your magical thinking completely, but we see now that we were a little too effective in our efforts to convince you that either we did not exist or we did and we were simply not as scary as you first thought. To us, the great pendulum of belief, as it were, has swung too far in the other direction. Instead of hunting us, the undersigned creatures of the supernatural kingdom, the vast majority of you are either no longer afraid of the dark or you accuse other humans of taking our guise and committing the acts we traditionally do. This is, in a word, disappointing. In our defense, we felt we had no choice but to rethink our relationship with you humans and our role with respect to this holiday in the modern era. You see, as humans continued to rely on technology to advance your cityscapes we–the undersigned Creatures of the Supernatural–realized that our very lives, eggs, and broods were threatened on a global scale. No longer could we hide in the shadows or creep under the stairs; your inventions (namely the “street lamp”, “gunpowder”, and the “telephone”) allowed you to peek into the darkness and coordinate your efforts to hunt us more effectively than ever before. While torches and pitchforks were, in fact, understandable given that you obviously also wished to keep your children safe, we felt that modern inventions that harness the power of lightning (e.g. what you call “electricity”), earth-blood (“gasoline” and “oil”), and the atom (“nuclear energy”) have taken monster-hunting a bit too far. Do you not know that there is no end to this madness? The more terrible the weapons you make, the more frightening we, the undersigned, can and shall become. Truthfully, however, it wasn’t until the nineteenth century that we creatures began to organize and form a strategy for the future. We became anxious, you see, for the atrocities you committed against one another concerned us, the undersigned. If you were so willing to murder your own kind–for power, land, yellow metal, and bits of paper, mostly–what would you do when you found out a litter of werewolves made their home nearby in a forest? Or that the mayor’s wife in your small town was a vampire? Thus, we opted to take the matters of survival into our own hands by hiding among you so we might act on our own behalf when the time was right. We felt that violence was not the best option in an age where communication is more effective than ever before. Instead, we chose to slowly immerse ourselves in your human world both politically and legally by acting on your behalf so that we might sneak in a few (what you might recognize to be ambitious or problematic) laws that benefited our true aims. This tactic was engineered so that you might trust our representatives as they attempted to blend in. To date, not one of our agents has been identified and we did achieve some moderate levels of success in the twentieth century, namely through the protection of historic places and national parks. Sadly, our overall mission failed due to one key area: human rights. The modern era has given us the opportunity to study you like never before with shocking results. Our attempts to procure legal protections for various members of your species were either laughed off or viciously thwarted. It seems, much to our collective surprise, that you humans cannot agree on anything–not even where the treatment of other humans are concerned. 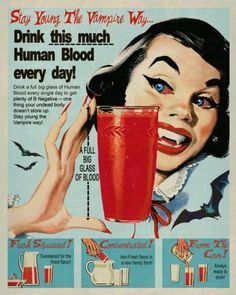 Mind you, we do have our differences within the supernatural community, but we are less concerned about the color of our scales or how long our fangs are than you are about certain innate biological traits you humans possess. Baffling though this dichotomy may be, you must understand that it never once occurred to us–not since the dawn of human civilization–that our food source would care about such pithy and insignificant attributes. And, while we always suspected you humans were illogical beings, we learned this hard lesson at great cost during your World Wars. Thus, we shifted the bulk of our efforts to a different field to exercise our pro-monster goals in a more direct way: through advertising. The fascinating world of advertising has allowed our agents to create, share, and distribute pro-monster propaganda. Some of our attempts to focus solely on human-centric products have proven to be misguided, like Exhibit A. 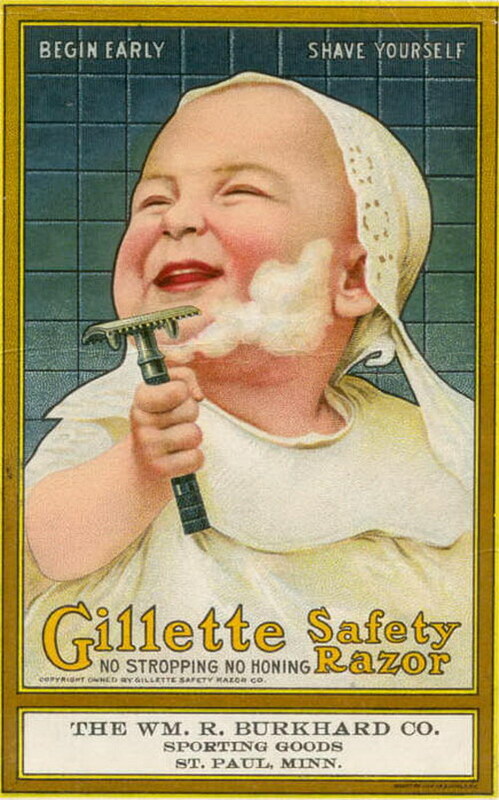 In our defense, however, the minotaur assigned to create this advertisement did not understand the cycle of hair growth for your young males. Admittedly, not all of our campaigns were deemed a success. We did get some pushback from your authority figures, which we have come to understand are primarily middle-aged, moderately-wealthy, white males who answer to later-aged, extremely-wealthy, white males. (It should be noted that we do perform monster-to-human outreach by educating some of these males on the subject of empathy for others through a rehabilitation program designed by the fae.) Exhibit C is the result of a failed attempt to recruit more demon-worshippers. Instead of cultist robes, our minions were forced to re-draw the headpieces and alter them to resemble scholarly caps instead. 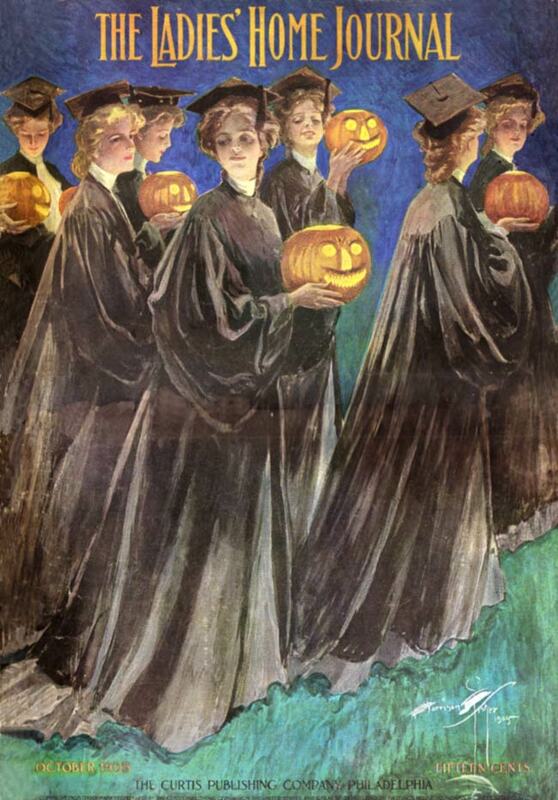 The addition of a jack-o-lantern is also a last minute change, for originally the women were holding the blood-filled skulls necessary to summon the appropriate demon at the proper moment—which, in short, was the entire point of the ad in the first place. 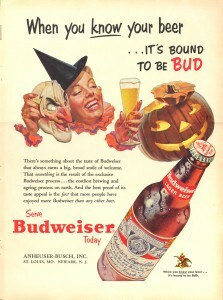 We are confident that history will show Halloween became a more popular holiday in the United States due to advertising. Everything that can be produced has been promoted for the holiday, even your mind-altering substances like Budweiser beer. (Many of us still imbibe this delightful fizzy beverage and would like to note we are thrilled with the addition of lime.) See Exhibit D.
As we stated in the above paragraph, we did experience a slight reprieve from our own fears about our future. The marketing onslaught of everyday household items to be consumed or used for Halloween, combined with several of your moving pictures from the 1970s and 80s (namely “Gremlins”, “The Exorcist”, and “Puff the Magic Dragon”) allowed us to breathe a sigh of relief and not worry about your ever-expanding foothold into our homes. For a short time, we were able to withdraw back into the shadows and feel safer than we ever had before. But, as they say, all savory morsels must eventually be swallowed. Fast forward to today. What happened, humans? Have our pro-monster campaigns worked a little too well? Now, you are obscuring the meaning of Halloween by turning a specific portion of your females into… Well, not even our mummies can figure that one out. But, more to the point: since when did Halloween become a holiday to promote mating rituals as opposed to recognizing that this night is the only time during the year when the veil between worlds is the thinnest? Why are you no longer honoring the dead or fearing–to be perfectly blunt–us? See Exhibit E.
Worse, it seems your obsession with a specific female body type has now begun to impact us on a grander scale, too. You have subverted the one, last holiday where we, the undersigned Creatures of the Supernatural, have traditionally had the license to chase, frighten, warn, prophesy, and prey upon you. It fascinates us that the costumes you once wore were meant to scare others, but now? They seem to be less about fear and more about the right to get drunk and take the costume off. (Several of us would like to know the point of buying a garment if you plan to remove it quickly.) Worse, we’ve even heard that some of you humans have taken our pro-monster propaganda into the bedroom, for you now wish to “fall in love” and “get married” to our various species, thus producing cross-bred offspring in unprecedented and shameful numbers. This is not only ludicrous it is also dangerous—for our species are not compatible and these relationships typically end in the human’s untimely demise. At this point in our letter we must now pause, ask you to reflect upon all that we have said, and whisper our request in your ear. For all the aforementioned reasons, put an end to your insatiable lust and debauchery for this one October night. Honor us by acknowledging the symbiotic relationship we’ve had for thousands of years. 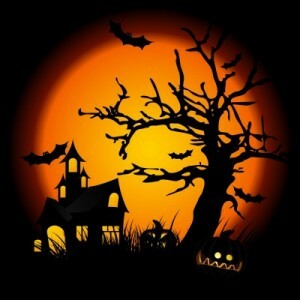 Bring back the spirit of Halloween, undo this extreme and unnatural form of pro-monsterism, and help us restore the natural cycle of death, life, and rebirth. 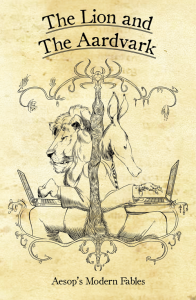 Just a quick note today to let you know that copies of The Lion and The Aardvark (Aesop’s Modern Fables) have been spotted on bookstore shelves in the UK. I’ll have more information about when this tome will be available in the U.S. soon, or you can check the publisher website at www.stoneskinpress.com/ for updates. Provided just for you, dear Readers, is an atmospheric tale to get you in the mood for Halloween. May your trick-or-treating yield fantastic results, and may the spirits be kind. . . The witch flashes him a crooked grin and picks a small book off the burnished wood counter. Has it really been a year since she last made her favorite recipe? Lately, it seems like all of her time has been devoted to nursing Alwin. No matter what she gives him — cinnamon, tincture of licorice or willow bark roots — nothing seems to help him get any better. “Maybe I missed something,” Belinda whispers as she scans through the book. Her gnarled fingers turn the pages gingerly, as if each leaf of paper is a cherished family heirloom. Belinda rolls her eyes. She has to concentrate and she can’t think if he keeps talking. Of course he’s lonely, but there’s nothing she can do about that. Born under a harvest moon, Alwin’s only friends were the ravens that often circled the skies above their cabin. His insatiable curiosity was the only thing the witch didn’t like about him. Still, empathy was never her strong suit. He was dying and she wasn’t sure her magic could cure him. Alwin ignores her and yanks more hair from his crusty scalp. Belinda crosses her bony arms and regards him sternly. She has to get him out of her hair, does she have the heart to kill him? The boy doesn’t have that much time left, but she still feels responsible for him. The witch knows the boy won’t stray very far from the cabin. If the trees and the corn fields don’t confuse him, the owls will. Just last night, Belinda had awakened to the sound of a screeching owl perched above his bed. It was as if the entire forest not only knew what Alwin was, they were eager to share the secret. Lost in her thoughts, Belinda barely hears her son’s whimpering plea. The witch knows Alwin won’t last that long. His skin is crumbling and his fingers are starting to dry out. If that isn’t bad enough — he’s beginning to reek of mold. To take her mind off of Alwin’s predicament, Belinda turns back to her favorite recipe. She can’t help but smile as she gathers the proper ingredients and dumps them into her cauldron: tiny snails, fat slugs, pumpkin seeds, a virgin’s eyes. National Flash Fiction Day! Read or Add Your Own! This morning, I found out from author Saladin Ahmed this morning that it’s National Flash Fiction Day. He posted a link to his flash fiction piece which debuted on Strange Horizons called Doctor Diablo Goes Through the Motions. To my recollection, there’s a few authors who post plot seeds for flash fiction. Chuck Wendig does this every Friday and I know Lili Saintcrow does this on occasion, too. Hope you get the chance to enjoy National Flash Fiction Day! If you’ve got a favorite piece out there, whether it’s yours or something someone else wrote, feel free to add a link to it in the comments below. Mood: Feeling a little behind. Caffeinated Beverages Consumed: Two with a side of four. Work-Out Minutes Logged Yesterday: Walkin’ with mah boots. I’m excited to announce my latest short story entitled The Message is available for you to read online at Bewildering Stories. The Message is a work of flash fiction with a dystopian science fiction theme. The reason why this story is called The Message, is because there’s a hidden communication to the reader embedded in the work. On the surface, it seems innocuous, but is it really? Find out! After you read my story, I invite you to check out the other fine works in Bewildering Stories, Issue 421.